The phone order entry module allows store admins to create orders for their customers without having to have password information. This can be handy for customers who don't wish to register, or for large sites that uses CSRs to place orders over the phone, and for catalog-only sites. To place an order, first find the customer account by searching by last name, email address, customer ID, or an order number - or click the 'Create New Customer' button to register a new account. NOTE: Phone Order Entry cannot be performed for admin accounts. Once you've chosen a customer account to use, verify that the account information displayed is all correct. 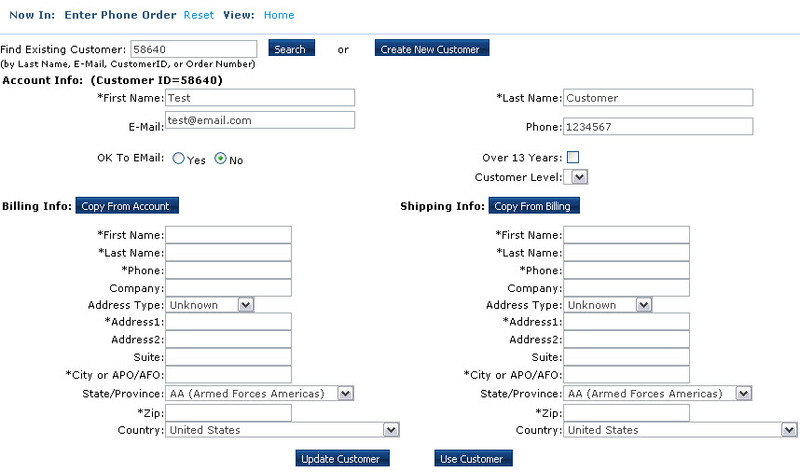 If it needs to be corrected (or if this is a new customer), enter all the correct details and click 'Update Customer'. Once the information is all correct, click the 'Use Customer' button to start the order. During the phone order process, you will see almost exactly what the customer would see while browsing your site, with the exception of menus (find products using the search box or one of the 'Sitemap' buttons. If the customer is in a customer level you will see the same products and prices they would if they were browsing the site. Navigate to the products they want and add them to the cart exactly as the customer would, then PCI guidelines suggest that in the interest of maintaining security you exit the order, contact the customer and ask them to log in and checkout. If you are using the Smart One Page Checkout, this should not be an onerous process. If, however, it is vital for you to process the financial transaction on behalf of your shopper, then please use the 'Checkout' button to proceed through the usual checkout process. NOTE: It is very important to use the 'Cancel Order' or 'Done order' buttons to leave the phone order process. Do not just navigate to another area of the admin site without clicking one of those 2 buttons first.